Cover to the April 15th, 1989 issue of TV Guide | Copyright 1989 Triangle Publications, Inc. Ad for One of the Boys on NBC | Copyright 1989 Triangle Publications, Inc. 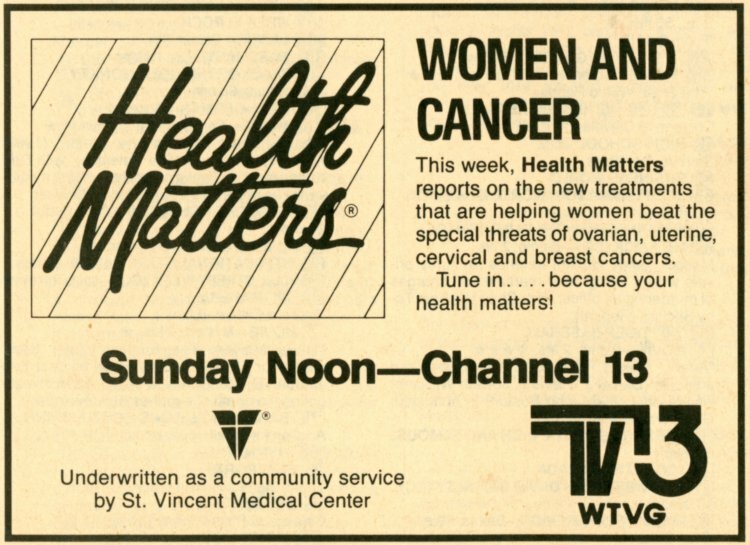 Ad for Health Matters on WTVG (Channel 13) | Copyright 1989 Triangle Publications, Inc. 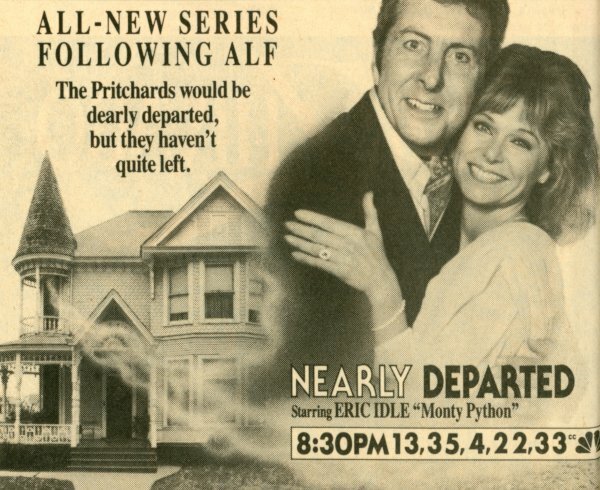 Ad for Nearly Departed on NBC | Copyright 1989 Triangle Publications, Inc. 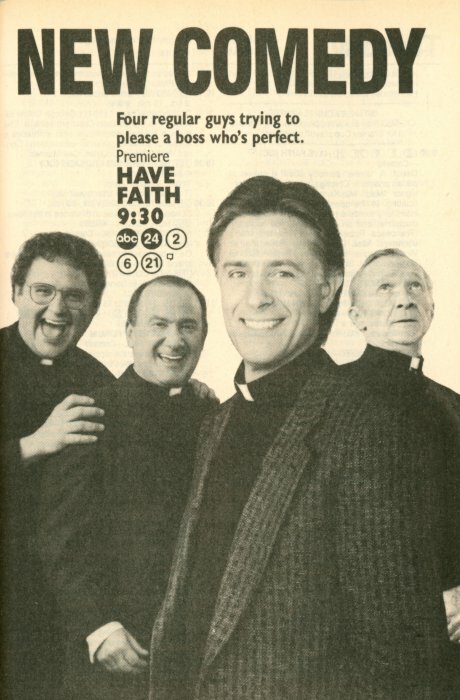 Ad for Have Faith on ABC | Copyright 1989 Triangle Publications, Inc. The article about World Monitor is the best of a weak selection of articles this week. I had never heard of the news program, a companion to the Christian Science Monitor newspaper, before reading about it in this issue. It debuted on September 12th, 1988–the same day as USA Today: The Television Show, which earned low ratings and negative reviews. World Monitor, airing on The Discovery Channel, is likewise low-rated: it averages roughly 300,000 viewers each weeknight. Yet it is popular with critics and has become a haven for network news cast-offs like John Hart, Sanford Socolow, and Meredith Lewis. 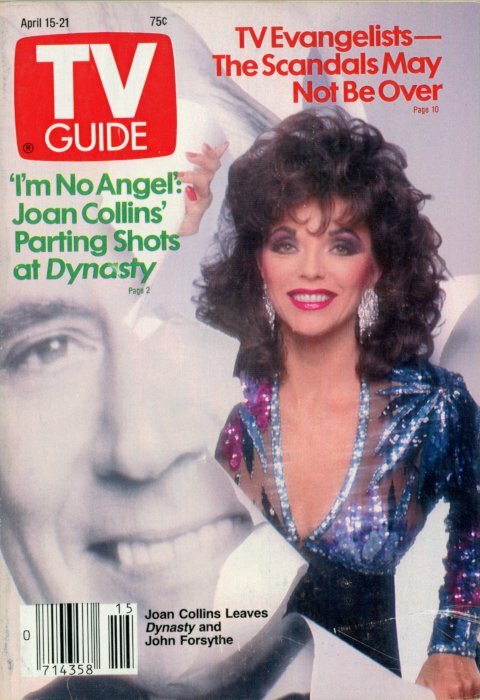 I skimmed the articles about Joan Collins, Greg Evigan, and Jess Walton. Fans of Dynasty, My Two Dads, and The Young and the Restless may find these 30-year-old profiles interesting. I can’t say I do. I skipped the articles about baseball stadiums and TV evangelists. The article about Jodi Thelen is not an article at all, just a small box with information about her hobbies and dream roles. The picture feature is about NBC’s upcoming miniseries Around the World in 80 Days, starring Pierce Brosnan. Lawrence Eisenberg’s Grapevine includes tidbits about Katey Sagal’s experience walking around New York City, Lynn Whitfield’s thoughts on how TV casts blacks, how NBC almost censored Dennis Miller, and more. Alan Carter shares stories about Trent Bushey, Hillary Bailey Smith, and Linda Dano in Soaps. Mel Durslag’s Sports View tackles the Dodgers winning and the Orioles losing. Prices from the Video Cassette Report for movies on VHS: Bat 21 ($89.95), Cocktail ($89.95), Crossing Delancey ($89.95), Dead Ringers ($89.95), Gorillas in the Mist ($89.95), Son of Frankenstein ($29.95), Sweethearts ($29.95), They Live ($89.95). Cheers ‘n’ Jeers praises the evolution of Peter Scolari’s character on Newhart, criticizes CNN for putting a logo in the lower right-hand corner of the screen, laments how Tour of Duty has shifted focus this season, and applauds the “consistency and cleverness” of Knots Landing this season. I was awed by the magnificent portrayals by all the actresses in “The Women of Brewster Place,” not just the three featured in your article. This drama far surpasses any recent movies I’ve seen at the theater. The sexist nature of two of the articles in your March 18 issue–“Are Women Reporters Better Than Men?” and “‘The Women of Brewster Place’: There’s Oprah, Jackee, Robin Givens–and a Break Men May Not Deserve”–becomes apparent when you reverse the genders. Male bashing seems to be in vogue, and because the women’s movement has succeeded in putting men on the defensive, we (men) are considered safe targets for the media. Contrary to the last title, these days we deserve every break we can get! There are two In the News reports this week, one about Larry Hagman’s reactions to shooting scenes in Moscow and Linda Gray’s departure from Dallas, the other rating Oscar parties. On the Grapevine contains three reports this week. The Equalizer is getting a love interest, Avery Brooks will play piano in the May 6th episode of A Man Called Hawk, and upcoming Quantum Leap episodes will see Scott Bakula’s character cause the great Northeast blackout of 1965 and teach a young Michael Jackson how to moonwalk. According to The Ratings Race, the first Sunday installment of Moonlighting (on April 2nd) ranked fourth in its time slot with a series-low 6.9 rating and 11 share, making it one of the five lowest-rated networks shows of the week. 9PM ABC (24) (2) (6) (7D) (21) MAN CALLED HAWK (CC)–Crime Drama; 60 min. When Hawk (Avery Brooks) and Old Man’s ailing sister are among those taken hostage inside a hospital, Hawk attempts to give the gunmen a taste of their own medicine. Debut: Former waitress Maria Navarro (Maria Conchita Alonso) settles in as the new office manager at Lukowski Construction, where she finds owner Mike Lukowski (Robert Clohessy) also in need of some management in his personal life. 10PM ABC (24) (2) (6) (7D) (21) MEN (CC); 60 min. The guys consider pooling their money for a sailboat, but Charlie (Ving Rhames) must first deal with sinking self-esteem after losing his job, while Paul (Saul Rubinek) thinks his ship has come in after a favorable audition for a TV talk-show spot. Circumstantial evidence is all Danny (Chris Young) needs to convict his father (Hugh Maguire) of sharing Danny’s prurient interest in Lisa (Lisa Patrick). Gus (Devin Ratray) proves that chivalry isn’t dead–nor is the male ego–when he quits the wrestling team to avoid grappling with a girl. Debut: A “divine” comedy about a passel of parish priests in Chicago, with Cubs fan Monsignor “Mac” MacKenzie (Joel Higgins) officiating. In the opener, Father Tuttle (Frank Hamilton) wields a ruler to enforce classroom discipline; and an overzealous job applicant (Francesca Roberts) anoints herself Mac’s secretary. Ann (Wendy Phillips) swears she’ll learn how to drive even if it kills her–and her teacher (Robert Guillaume) too. In a revamped, jazzed-up version of the drama “Tattinger’s,” which aired last fall, Nick (Stephen Collins) leaves the restaurant in Hillary’s hands when he goes to Brazil, and comes back to find a revamped, jazzed-up version of the eatery. 8PM NBC (13) (35) (4) (4D) (22) (33) JIM HENSON (CC); 60 min. Ted Danson joins Kermit and the Muppets for a day at the beach that includes a brush with pirates and a lesson about the evolution of humans. Songs: “Splish Splash” and “Maneater.” The story is about a man from “Lighthouse Island,” who has an unusual experience when he bicycles into town to buy his fiancee a wedding present. 10PM NBC (13) (35) (4) (4D) (22) (33) DREAM STREET–Drama; 60 min. At a particularly romantic moment, Marianne (Jo Anderson) invites Denis (Dale Midkiff) to her house; Harry (Peter Fretchette) sets his sights on getting back his stereo system from his ex-wife (Wendy Makkena); and Joey (Thomas Calabro) meets Joni’s parents, who are less than thrilled with his line of work. Another lackluster issue but there sure were a lot of short-lived, forgotten TV shows on the air this week 30 years ago. That’s it for this issue. 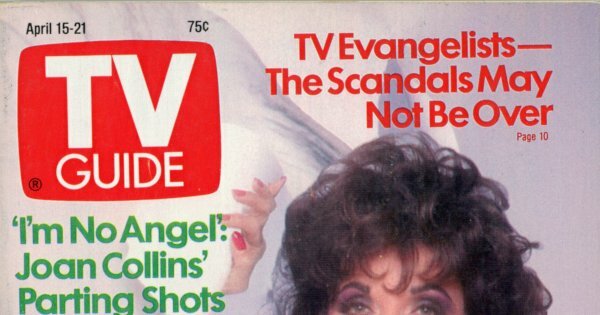 Check back next week for my review of the April 22nd, 1989 issue of TV Guide. As always, hit the comments with any thoughts or reactions. Interesting how CNN was attacked for something that is unavoidable 30 years later! It’s still better than being called “fake news”…LOL! !